We welcome you in the heart of chartrons neighborhood overlooking the Garonne, on the second floor of a building typical of the eighteenth century (unique décor with high ceilings, hardwood floors, fireplace ...) rare situation in front of the tram B, bicycle and boat VCub, 800 meters from the city of wine and 10 minutes from downtown. Delicious and large Breakfast on demand : all you can expect from a typical french breakfast ! 7,5 €/person. A brand new shower room just builded in 2018. We had an amazing 4 night stay at this magnificent accommodation. It is very special and unique. It is a small piece of Bordeaux history as it was originally. Many thanks to Regine and Nicolas for being great hosts. Highly recommended especially for the stunning location. We would love to return soon. Thank you so much Fran for your evaluation . And just tell you that your st Patrick’s chocolates were delicious !! This is a lovely property with kind caretakers in a central location. Warm, convenient and in excellent repair. A very beautiful original peice of Bordeaux history. A grand entrance and thoughtful hosts. Nicholai and Regine are very friendly and their beautiful home is picture card perfect. Close to transport, coffee and river , and everything that Bordeaux is renowned for. It was a real pleasure to meet you !! 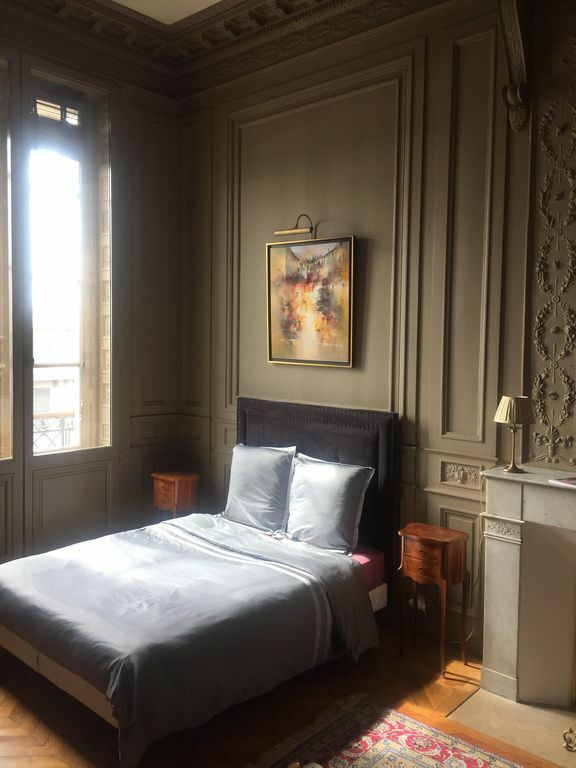 My wife and I enjoyed a two-night stay in this elegant room located in the upper story of a Bordeaux mansion built in 1792. It is located right across from the quai along the banks of the Garonne river through the heart of the city. Many of the key historic sites in Bordeaux are in easy walking distance. The broad promenade along the Garonne is amazing in itself just for people watching. The room retains all of the original elegance and decor of the eighteenth century, with very high ceilings and carved panels and wainscoting. There are double doors which lead out to a balcony overlooking the quai and the Garonne. The separate, private bathroom is brand new, spacious and has every amenity, with a large shower, double bowl vanity and a heating rack. The optional breakfast is excellent. Regine and Nicolas are excellent hosts. Nicolas provided us with all the information we needed for accessing and using the building and the room, as well as for site-seeing and eating in Bordeaux. We highly recommend this property. We stayed 2 nights prior to a river cruise. The room is ideally located overlooking the promenade. The river cuise boats dock just 100 metres from this property. The property is just a 15 minute walk from the town centre or a short tram ride. The tram stops very close to the property. This property is also located between the wine museum and the water mirror. Restaurants are close by. We enjoyed breakfast on the balcony overlooking the promenade. The hosts, Regine and Nicholas, were both gracious and accommodating and respected our privacy. We would definitely stay here again. We were extremely pleased with this accommodation in a family home. The family rents only one room in the house. It is a single room with an adjacent modern bathroom that is completely private from the rest of the home. We could come and go as we pleased without bothering or being bothered by the family. It is clean, comfortable and well-appointed. Nicolas our host was very helpful in making sure that we had everything we needed. At our request he installed a TV set which he said will stay in the room. Breakfast was available for a small additional cost. It is ideally located overlooking the river where there is a long open promenade and a row of restaurants. Although it is only a 15 minute walk to the centre ville it is right next to a stop on the city tram line with only 3 stops into the city center. We purchased 7 day tram passes for unlimited trips which made getting around the city a breeze. We were traveling with a car and parking was a challenge. There is a large parking structure across the road that we used once, but usually we were able to find free roadside parking within several blocks of the house. The host family was gracious and helpful, we really enjoyed the room and we highly recommend it as superior accommodation in an ideal location for a stay in Bordeaux. Thanks Murray for your precise appreciation. I'm sure it will help other guests in their choice ! Close to CITE DU VIN , MUSEE CAPC, and with Tram C PARC DES EXPOSITIONS.